I took the day off last Friday. It was the first warm day of spring. 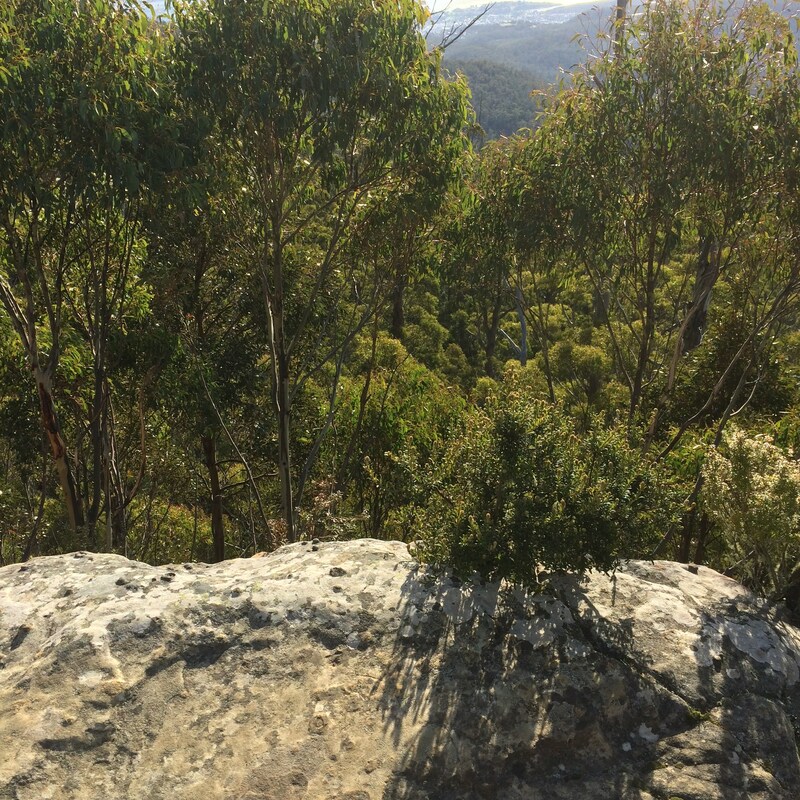 The weather in the morning was absolutely perfect: still, bright warm sun, without being too hot as the Tasmanian sun often is, and crisp, clear, clean air to breathe. 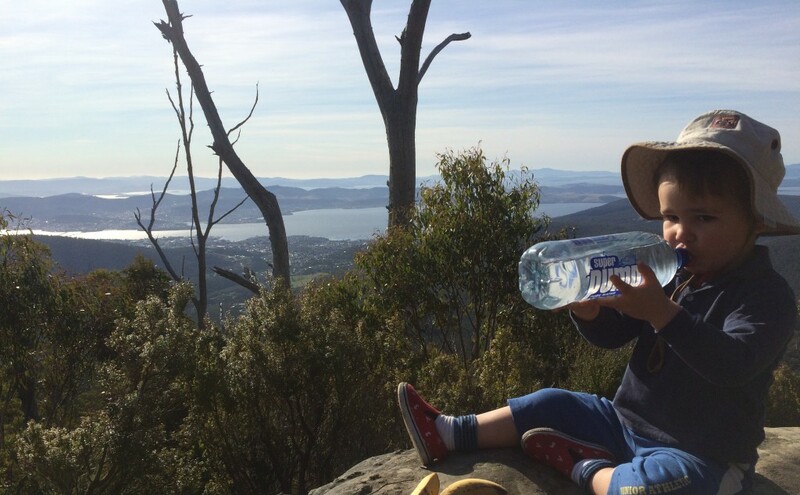 I spent most of the day with my little boy Peter, and we explored the mountain. 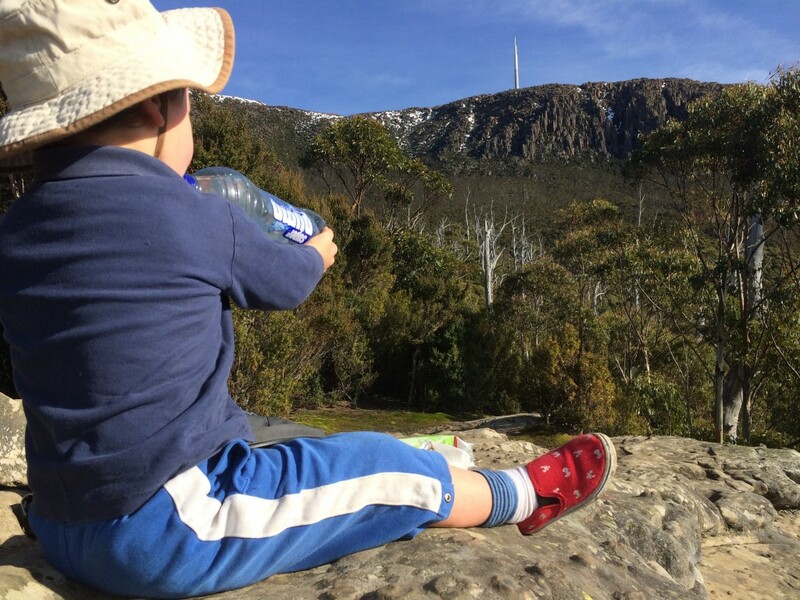 After his sisters left to go to school, and mum to go to work, he and I grabbed some snacks and drove to The Springs. We were going to walk to Sphinx Rock, have some morning tea there, and then maybe walk a bit further. The day was glorious and we didn’t feel the need to be too specific. 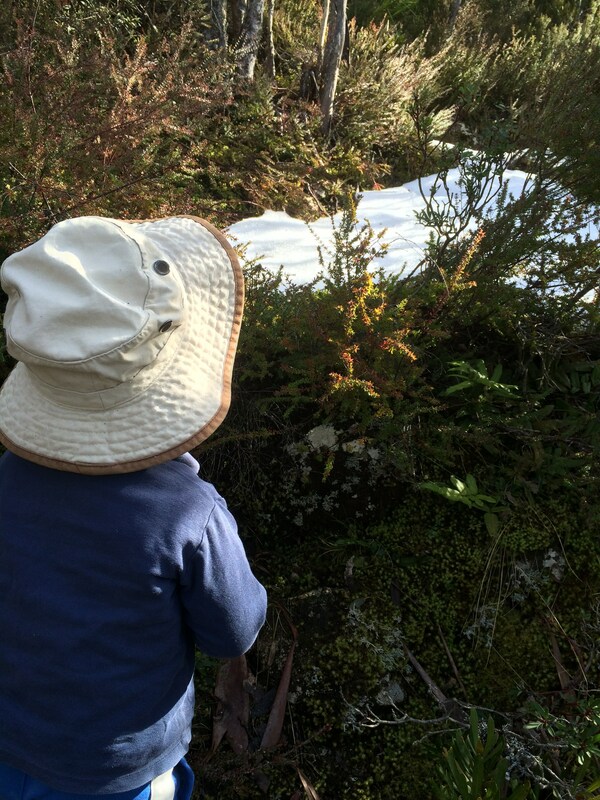 Bushwalking at a two-year-old’s pace can be frustrating. After a minute, Peter found a great stick, and so we had to stop at each rock and each tree to give these trees and rocks a poke. Patience is good for the soul. Peter had many questions about the drains on the side of the path, and the leaves, and the forest. 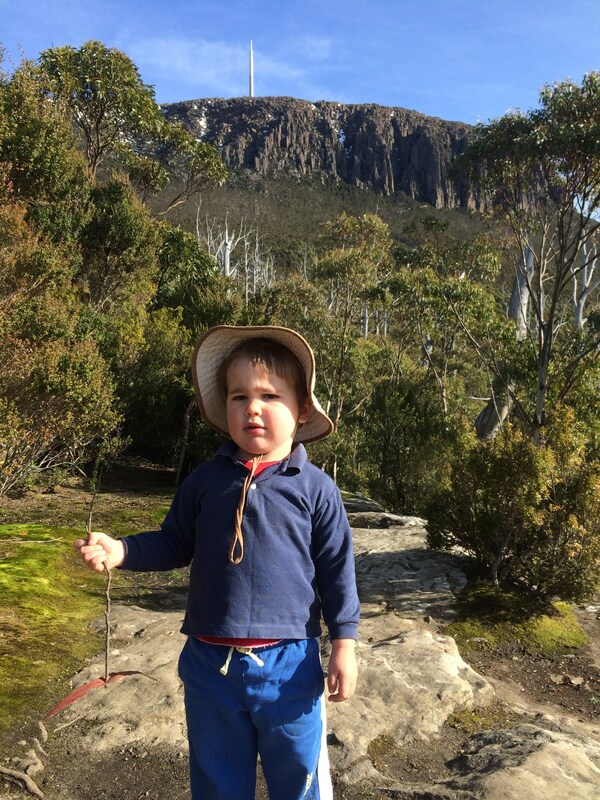 The track from The Springs to Sphinx Rock (Lenah Valley Track) is well formed and very accessible to little legs. Eventually we made it to the rock, which is gated and seriously signposted for danger. I think we counted 5 signs warning us that THERE BE CLIFFS. 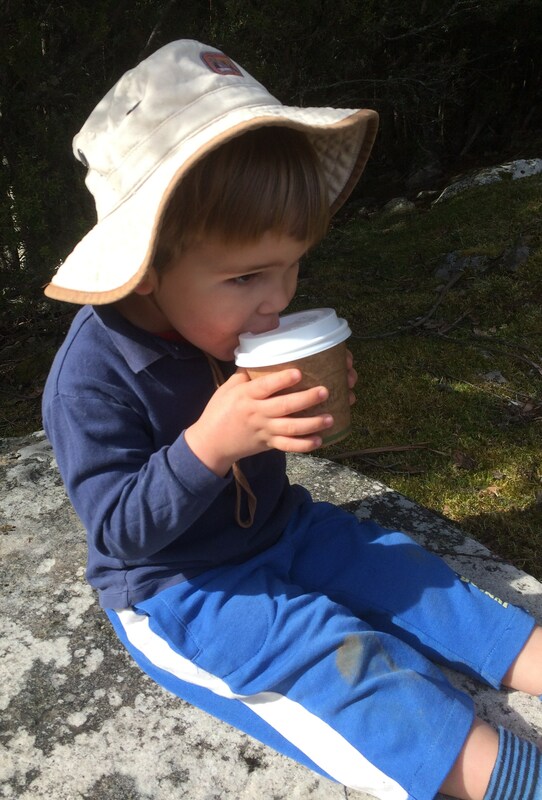 We sat down in the early spring sun and basked and ate our morning tea. We took our time there. I can’t remember when I have last enjoyed sitting in the sun so much. Most of the time, I just get burnt! I was of course pretty careful with Peter, but he was very sensible and stayed well away from the edge. 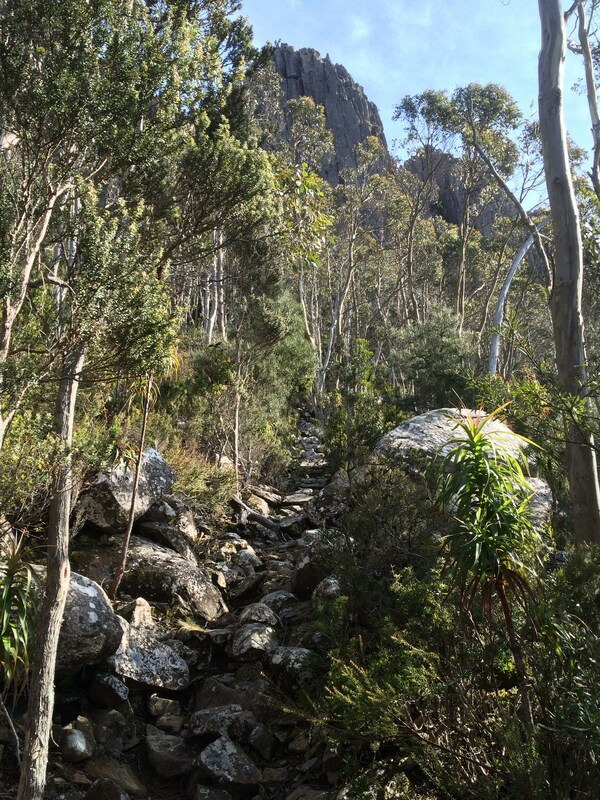 After that, we weren’t ready to head back to the car, so we decided to climb up the Sawmill Track to the Organ Pipes Track. This was a much more challenging track, so Peter traversed it on my shoulders. 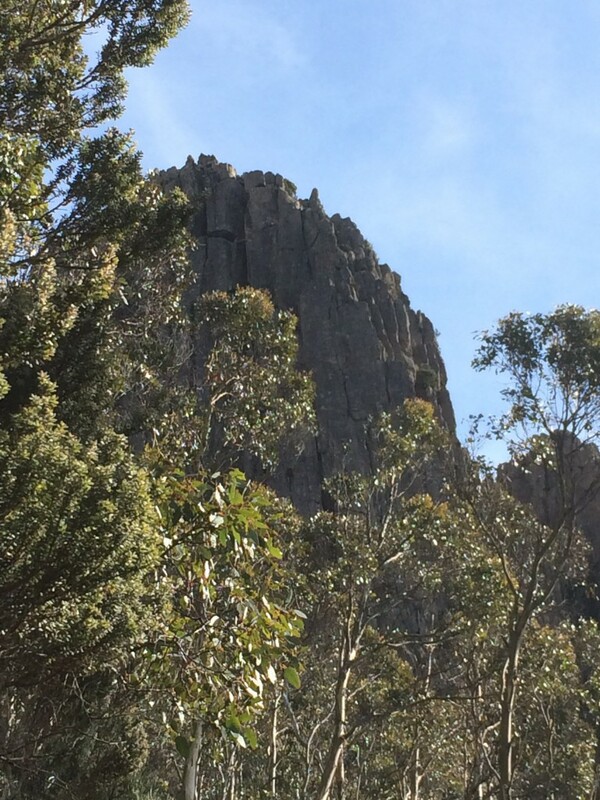 We crossed the road and eventually made it up to the 1000m mark, about where the Organ Pipes Track runs. 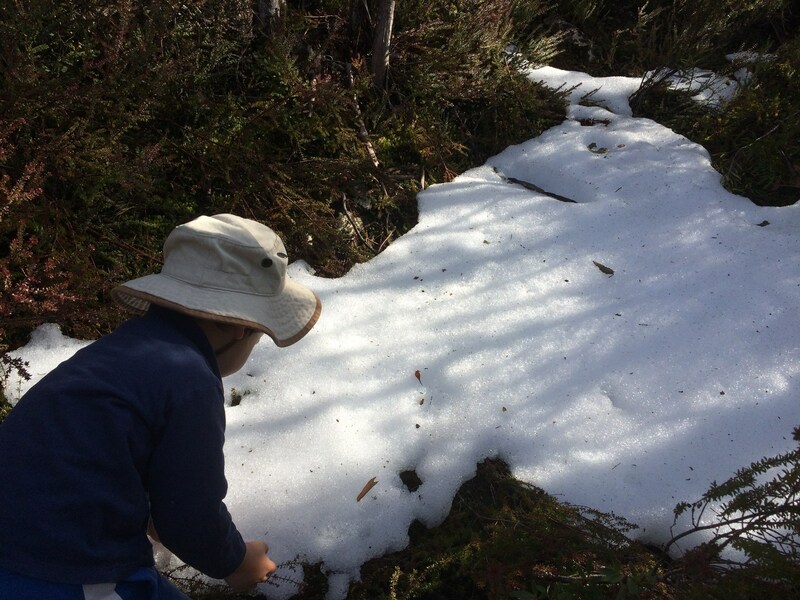 On the Organ Pipes Track we were excited to find snow! Peter was very pleased and ate a nice handful. After that, he spent some time on my shoulders, and some walking, and climbing over rocks, as we made our way back to the car. Near The Springs, we saw a triangular shaped building. 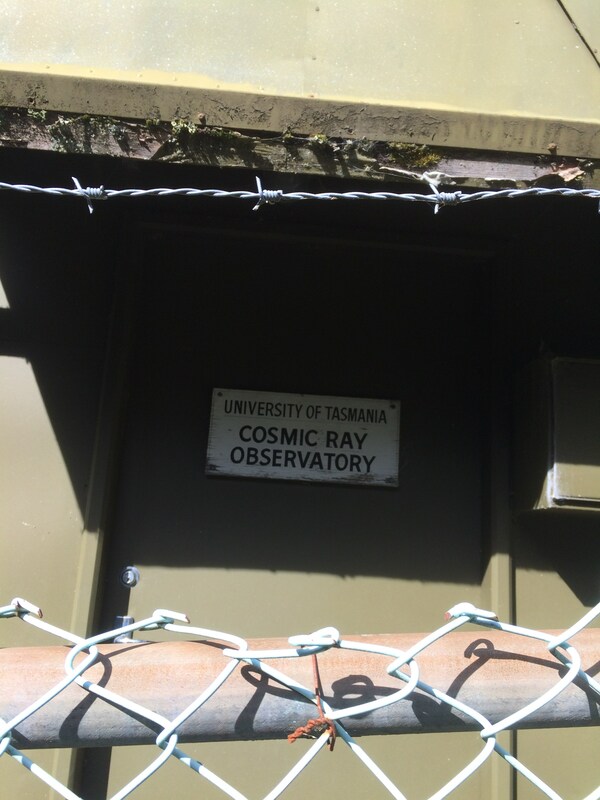 I expected it to be a utility building of some kind but it turned out to be a Cosmic Ray Observatory. That’s pretty cool. Finally, we treated ourselves to a coffee and a babycino. Later that day, we decided to go on a ride, from our house in Ridgeway. The weather was still good, so we rode back up the mountain, past The Springs, all the way to The Chalet, at 1000m, at the far end of the Organ Pipes Track. It was a bit funny to be riding past the same areas we’d walked that morning, but the mountain was nearby and was beckoning. 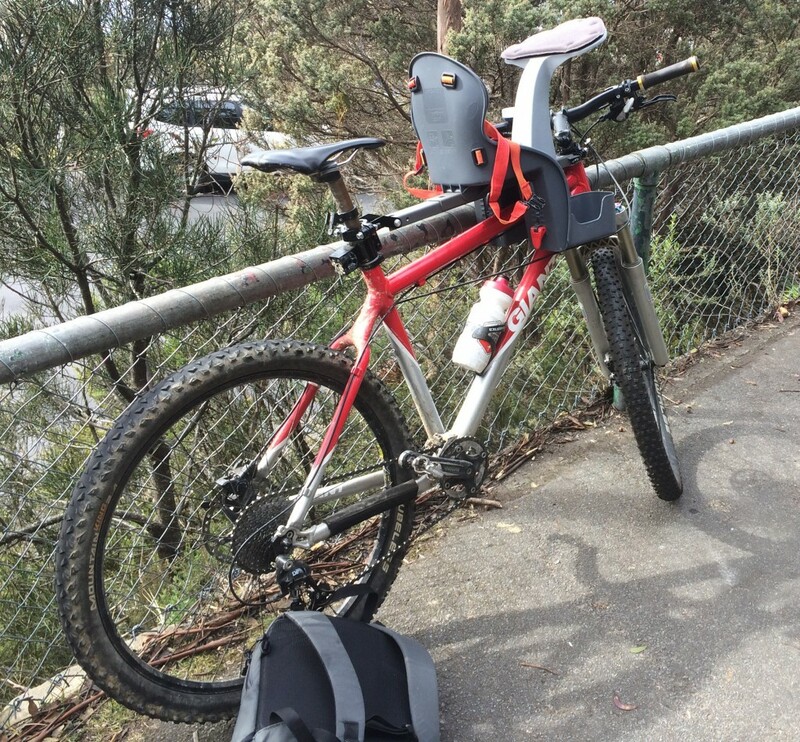 Riding up the mountain is hard work with a baby seat on the front! The seat stops you from getting out of the saddle, and you have to ride with your knees out like you are a cowboy or something, which gets a bit uncomfortable. I was glad to pause at The Springs to get some food out of the pack for Peter, and even more glad after the last 100m to The Chalet, where the wind picked up and ever so nearly brought us to a complete stop! After a few minutes at The Chalet, we decided that it was getting too cold to go further up the mountain, and we rolled slowly back down. We stopped at The Springs to give the brakes a chance to cool, and explored the hut. 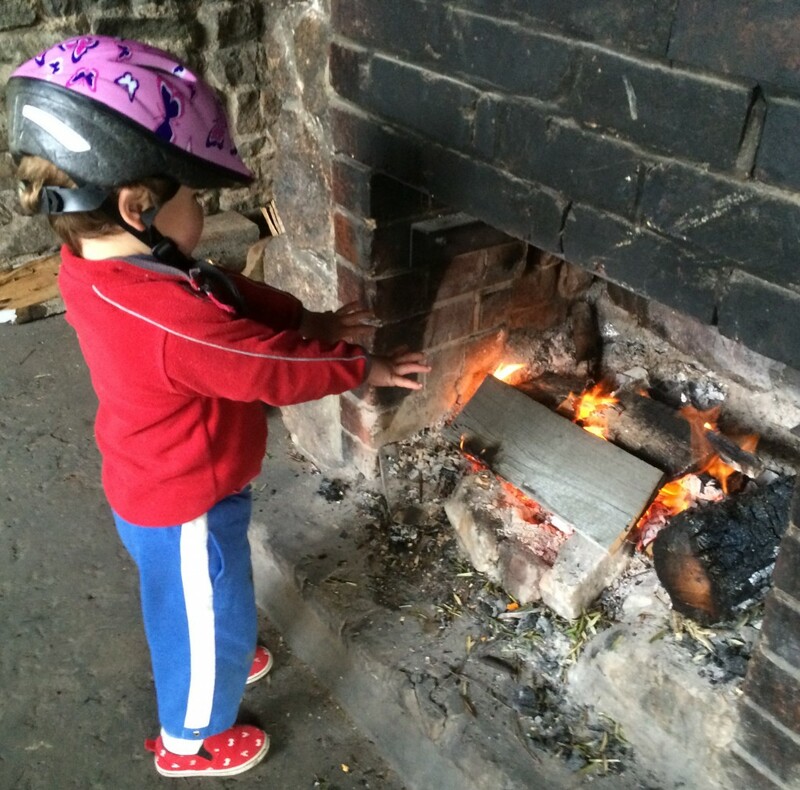 Peter enjoyed the crackling log fire. 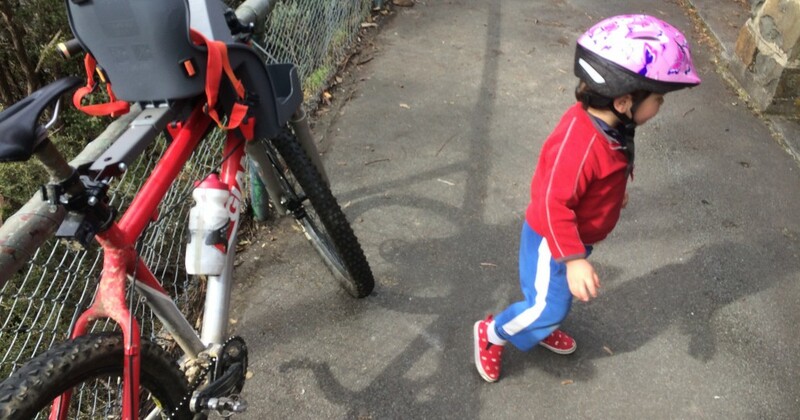 We had a slow and safe descent, and arrived home just in time to go and collect the girls from school. My legs were very tired after this effort, but I had promised my eldest daughter that I’d take her rock climbing that evening. I had not been climbing for a long time. Hobart has a great rock climbing place, Rock It Climbing Centre, and so the two of us headed down that evening to get in some climbs. No pictures of the evening. We had a good time but my body was ready to pack it in by the end! Four or five climbs each, some bouldering, and for my daughter, some tunneling. We mutually agreed that our muscles could take no more after an hour and a half, and we finished off the evening with a hot chocolate at the State Cinema cafe. A great day. I was very sore on Saturday though!